How to Make Homemade Wine. A Step by Step Guide to Making Red Wine. Making wine is a thrill and an adventure. If you want to learn how to make homemade wine, you will find many great books on the subject. You can also contact your local community college to see if they offer classes on winemaking. Here you will find a step by step guide to making red wine. It will give you an understanding about the winemaking process. 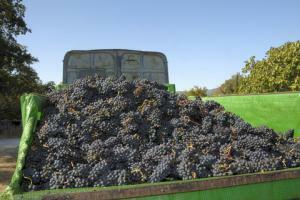 The first thing to considered is the space that you have available for your winemaking operation. You do not need a huge amount of space, even 8 x 8 square feet will be fine. What you will need is access to water. If you have space in your garage, that will be the best place; If you do not have water inside, you can always run a hose from a nearby outside faucet into your garage. 1. Rent a crusher from a nearby brew shop. 2. Buy the following supplies: wine yeasts, yeast food to feed the yeasts and keep them growing; malolactic bacteria to help soften the acidity in the wine; potassium metabisulfite to control oxidation. 3. Crush the grapes. You will need 55-gallon food grade plastic drums. The drums should not be filled to the top. Leave empty about one fourth of the volume of the container. This will give you enough space for the cap of grape seeds and skins that rices to the top of the juice. Make sure that you thoroughly clean the crusher before returning it to the brew shop. 4. Add potassium metabisulfite at the time of crushingtso yield about 30 parts of sulfur dioxide. 5. Measure the acidity and sugar levels in the juice. Sugar levels should be between 22 and 25 Brix. The acidity level should be between .60 and .80 grams per 100 milliliters. 1. Stir wine yeast into warm water. Water should be between 94ºF and 105ºF. This is important because if the water is too cold, the yeast will not grow, and if it is hotter than 105ºF, the heat will kill the yeast. Leave the yeast in the water for about 30 minutes. 2. Mix the yeast into the crushed grapes in the fermenter. Cover and let stand for a day or so. Make sure that the room is not too hot or too cold. If it is colder than 65ºF, insulate the container. 3. After a day or so, check to see if yeast is doing its job. If you see foaming, or hear noises coming from the fermenter, you will know everything is going well. At this time, stir the cap of crushed grapes into the must. Continue pushing the cap into the must twice a day until fermentation begins to slow down. 4. Add yeast food when fermentation begins. A good measure is 5 grams of yeast food per 5 gallons of must. Also, when sugar measures are at 18 Brix and and again at 12 Brix you should add 1 to 2 grams of yeast food per 5 gallons of must. When fermentation is almost at its end, mix a 1.5 packet of malolactic bacteria and add it to the must. 1. 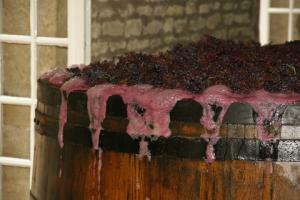 When fermentation slows and sugar levels are at or below zero Brix, begin to prepare for the press. You will need clean pails, clean carboys, and a funnel. 2. Rent a press from a nearby brew shop. Make sure that you have all the parts to the press. Assemble the press, and arrange pails and carboys. 3. 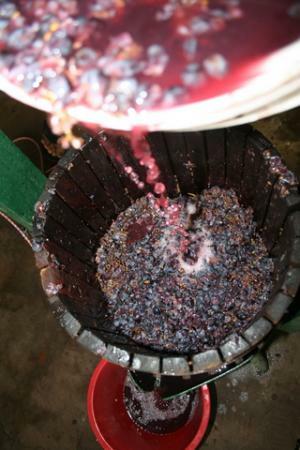 Scoop the wine/skins/seed mixture from the fermenter into the basket of the press. Let wine run down to the pail before adding more mixture. Assemble the blocks and plungers. 4. Begin the press by pulling the lever. Take breaks between lever pulls. Loosen the skins and press again. 5. Fill clear carboys, leaving a bit of space above the shoulder of the container. Cover carboy with drilled stopper that hash a fermentation lock filled with water. Place carboys in a room with temperature of 65ºF to 70ºF. 6. Check wine for spoilage. If there is a strong odor, much like rotten eggs, siphon wine to remove sediment. 1. Keep carboys at a constant temperature of 65ºF to 70ºF for two to three weeks. 2. Check wine for evidence of carbon dioxide bubbles. This will mean that yeasts are fermenting the last residues of sugar, and that malolactic fermentation may be occurring. 3. Once bubbles have stopped, check for malolactic fermentation by conducting a chemical test or by smelling and tasting the wine. 4. Rack the wine by siphoning it from its container onto a clean carboy. This will clarify the wine, and also aerate it. 5. Dissolve 1.5 grams of potassium metabisulfite in water and add it to each fresh carboy during racking. When the fresh carboys are full, place a fermentation lock on them. Placed them in a place where they can quietly rest. 1. Check your wine. Using a "wine thief" pour about 2 oz. of wine into a glass. Check it against the light by tilting the glass so that the wine can spread to the rim. Observe the clarity of the liquid. Also check it against a white background. This will give you an idea of the intensity of the color, and whether there is sediment left on the wine. Smell the wine and taste it. Asses the acidity and texture. 2. About a month after the first racking, rack the wine again. Again, add 1 gram of dissolved sulfite to each 5-gallon carboy before siphoning the wine into it. Place the fermentation lock on each carboy, and place them in a quiet place. 3. At this point, you may want to chill the carboys in order to promote the formation of tartrate crystals. 4. If you wish to give your wine an oak treatment, add oak chips at this point. Check your wine to make sure that the oak flavor does not become too strong. 5. After a few months, check the wine for clarity. If the wine is clear, rack again, adding 1 gram of sulfite per 5-gallons of wine. 1. About seven or eight months after fermentation evaluate your wine for balance, stability, and clarity. When you are satisfied, rack the wine for the fourth and last time. Add 1 gram of sulfite to each 5-gallon container during racking, this will prevent oxidation. Test and adjust sulfur dioxide levels. 2. 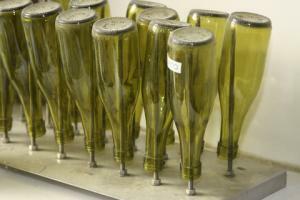 Bottle the wine in clean or new 750-milliliters bottles. Rinse new corks. When you fill the bottles, make sure to leave no more than half an inch of air between wine and cork. 3. After marking the cork and labels with the year and variety in each bottle, let the cases of wine stand upright for a day or two. This will allow the air in the small amount of air in the bottle to come to the same pressure as the air outside. 4. Store the wine cases on their side in a cool dark place. That is the guide on how to make homemade wine. The winemaker, you, is part chemist, part magician, and part historian. The enjoyment and satisfaction of having produced wine, and the deep understanding that the process will bring, cannot be measured. Now You Know How to Make Homemade Wine. Enjoy!